Garden Materials | Hanatoyo Landscape Co.,Ltd. Kyoto has been a rich source of garden materials: Rare Shirakawa-suna (granite sand), Mikage-ishi (granite), rocks from Kifune or Kurama hills, and stones from Kamo River, to name a few. 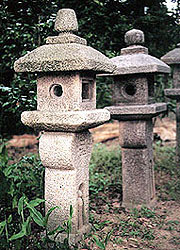 Other quality garden materials from all over Japan historically found their way to Kyoto, responding to the demand of leaders and the influential in this old capital since 794 B.C. Quality of garden materials we can offer today has this historical background and it is timelessly assured to be the best and authentic. 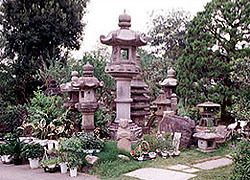 Our collection includes stone garden materials like various types of Tourou, Chozu-bachi, Sekitou and Izutsu, and all kinds of natural rocks (integral to Japanese gardens) like granite, schist, chert, sandstone. These are not just the integral part of high-quality Japanese gardens, but they themselves are crown masterpieces of Japanese culture that have to be preserved for the coming generations. Our garden materials will be delivered anywhere in Japan and around the world, accompanied by the advice that best fits in your garden. Garden trees, cover plants for greening, flowering plants, etc. foliage plant, flowering plant, etc. Trellis, fences, bricks, flower pots, etc.